Tulsa Youth Rowing Association Overcomes Arson Attack to Medal At Regional Championships. The Tulsa Youth Rowing Association rowed to a bronze medal in the girls novice quads this past weekend at the USRowong Central Youth Rowing Championships. The crew featured Madi Bickle (Lincoln Chrisain), Ashlyn Calloway (home school), Callan McFadden (Holland Hall), Maya Bulmer (Booker T Washington). 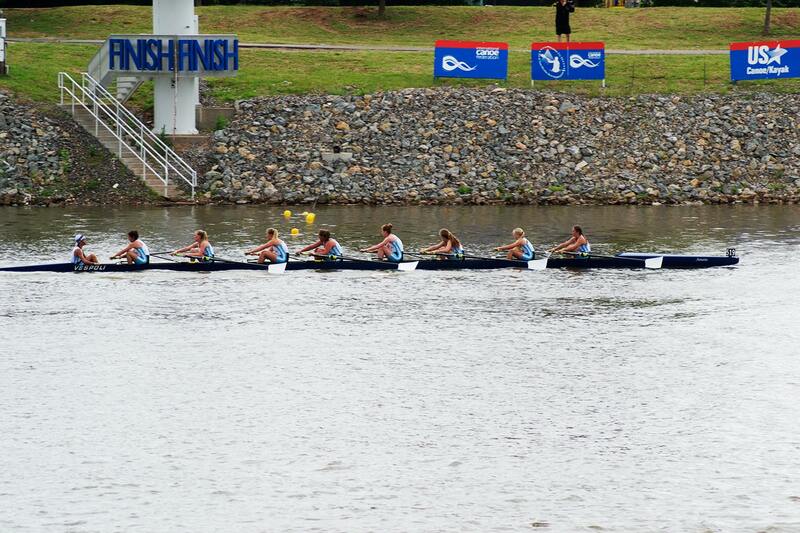 The USRowing Central Youth Rowing Championships features the top crews from Oklahoma, Kansas, Texas, New Mexico, Colorado, Arkansas, Louisiana, Missori and Nebraska. There were 23 different teams represented and over 400 entries. Additionally, the girls novice double of Callan McFadden (Holland Hall) and Maya Bulmer (Booker T Washington) raced to a 4th place finish in a strong field of the top 21 crews in the region. “I am so proud of my athletes, their confidence has grown so much over their first year of rowing. It’s really inspiring to see them accomplish so much,” said Tamara Clayton who is the girls novice coach at TYRA. Iain Kazmierzcak (Booker T Washington) raced to a 5th place finish in the regional. The girls varsity eight finished 5th in a terrific race against the top teams in the region: Nick Stanley (Jenks), Megan Nichols (Cascia), Kate Perkins (Cascia), Rose Stewart-Maddox (BTW), Ashlyn Johnson (BTW), Sydney McMahon (BTW), Gracie Poole (BTW), Lydia Bollinger (BTW), Erin Arthur (Bishop Kelley). In addition, the boys varsity eight finished 6th in a determined row in the finals yesterday: Jack Sadler (BTW), Drake Coburn (BTW), Luke Schula (BTW), Valentino Angelini (Jenks), Bryan Timmons (BTW), Grant Buchman (Home School), Carl Atik (Cascia), Connor Gonzales (BTW), Sterling Shine (Edison). The club is gearing up for a busy summer season with week long camps for 7th – 12th grade athletes that are looking to try the sport for the first time. Full information on the summer camps can be found here.